Although the Moon completes one orbit of Earth with respect to the stars about every 27.3 days, the Moon revolves around Earth once with respect to the sun in about 29.5 days following a slightly elliptical path at an average distance of 384,000 km. The Moon's gravitational force is nine times less than the Earth's, which means that you would weigh nine times less on the Moon. The Moon is a dead world with no atmosphere. The sky is always dark, and you can see the stars and Sun at the same time. Keep reading and learn more about Moon's phases, surface and exploration. New Moon is when the moon isn't at all visible in the sky because the sun is shining on what has falsely been termed the "dark side of the moon." Obviously it isn't always dark; it is just the side of the moon that we can't see from Earth. During a New Moon the stars appear to shine more intensely, making it the best time to view the stars! First Quarter is when half of the waxing or growing moon is visible because the Sun is shining only on half of the hemisphere that is visible from Earth. Full Moon is when the moon appears to be a complete circle because the Sun is shining directly on the entire visible hemisphere. Last Quarter is when the waning or shrinking moon is a semicircle because the Sun shines on the other half of the visible hemisphere. Have you ever noticed the dark areas on the moon? Depending on your imagination these areas may have resembled a face, a rabbit or something other interesting object. These areas are called maria, which in Latin means seas in Latin, because early astronomers thought they were large bodies of water. These areas do not contain water, but appear darker because they are deeper and covered with dark basalt rocks from ancient lava flows. Since the Moon cooled down long time ago, it is now geologically dead and all volcanic activity has stopped. Most of the surface rocks are between 3 and 4.6 billion years old. Most of the craters were form long time ago, yet the surface continues to be bombarded by meteoroids forming more impact craters and a layer of rubble and debris, called regolith. Since the Moon is so close to the Earth, it is the most studied celestial body. The most exciting of all studies were the astronauts' visits. Since 1969 twenty American astronauts have flown to the Moon. Some of them studied the Moon's surface and brought back samples of moon rock and dust. Among the long list of space flights, perhaps the most interesting was the Soviet Luna 3, which first photographed the Moon's far side. The satellites Clementine in 1996 and Lunar Prospector in 1998 registered evidence of ice at the poles. The Lunar Reconnaissance Orbiter (LRO), the first mission of NASA's Robotic Lunar Exploration Program, and its companion craft the Lunar Crater Observation and Sensing Satellite, known as LCROSS were launched in 2009. LRO is involved in mapping the moon's surface and collecting data to be used for determining potential future landing sites. LCROSS's main priority has been searching for water and ice. Russia and the USA are not the only countries exploring the Moon; China has recently announced plans to put astronauts on the Moon as part of their fledgling space program. Is the Moon made out of cheese? Nope, and there are not any cows jumping over it, either. It's actually made out of rock. Scientists now think that the Moon was formed from the collision of a Mars-sized object with the Earth. This impact hit the Earth with such force that it scattered bits of Earth rock into space. This scattered matter stuck together and formed the Moon. This explains why the Moon is less dense than the Earth: when rocks and metals were thrown into space from Earth, the heavier metal objects fell back to Earth, while the lighter rocks stayed in orbit long enough to stick together forming our Moon. This is why the Moon is composed of less metal than the Earth. We can see only one half of the Moon, because it is tidally locked with the Earth. This means it takes the Moon just as long to rotate on its axis as it does to orbit the Earth. This synchronous motion causes one hemisphere to always face the Earth. Even though the Moon's gravitational force is weak compared to Earth's, it is strong enough to be responsible for the tides on Earth and slowing down Earth's rotation. The moon is the perfect place for building a cosmic station. With a cloudless dark sky it is ideal for telescopic observations. The decreased gravitational force also makes launching a spacecraft easier on the Moon than on the Earth. Latin for oceans, these are large plains found on the Moon. 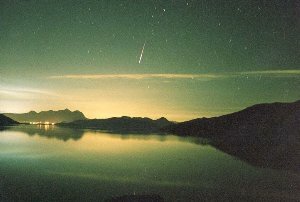 A small piece of rock or dust floating freely in space, before they enter Earth's atmosphere and burn up as meteorites. 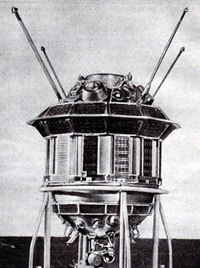 A Soviet probe launched in 1959, which returned the first images seen of the far side of the moon. 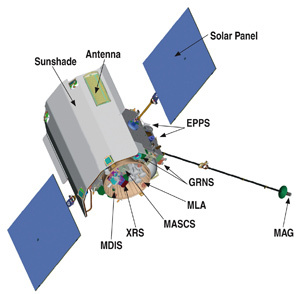 Launched in 1994, Clementine was a joint project between the Ballistic Missile Defense Organization (BMDO) and NASA, with the purpose of making scientific observations of the Moon and the near-Earth asteroid 1620 Geographos. One of the fundamental forces of physics; gravitational attraction is responsible for the attraction of bodies on the surface of a planet to the mass of the planet. The amount of matter in an object, measured in kilograms. Continuous streams of charged particles that are expelled from the Sun's corona at speeds of 400 kilometers per second. 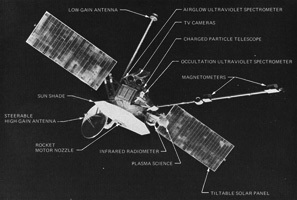 Launched on November 1973 by NASA, Mariner 10 was the last spacecraft of the Mariner program. It was the first spacecraft to utilize a gravity-assisted trajectory, a technique that uses the gravitational attraction of one planet to propel a spacecraft towards its next goal in order to conserve both fuel and power. The condition resulting from a two-planet or satellite system where one orbital period is twice that of the other. Resonances are possible with more than two planets; three of the Galilean satellites of Jupiter are in 1:2:4 resonances with each other. As a point of reference for the night (-275° F) and day (840° F) temperatures on Mercury, water freezes at 32° F and boils at 212° F, at 350° F you can bake a pie in your oven and a 90° F day can be considered a hot summer day for many of us on Earth. 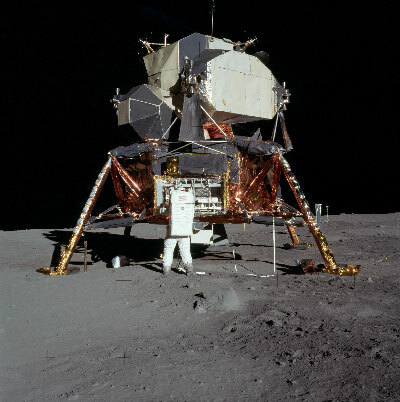 Photograph of astronaut Buzz Aldrin standing in front of the Apollo 11 lunar module, on July 20, 1969. 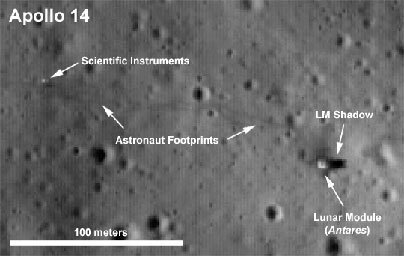 Landing site of Apollo 14, as photographed by NASA's LRO on July 17th, 2009.